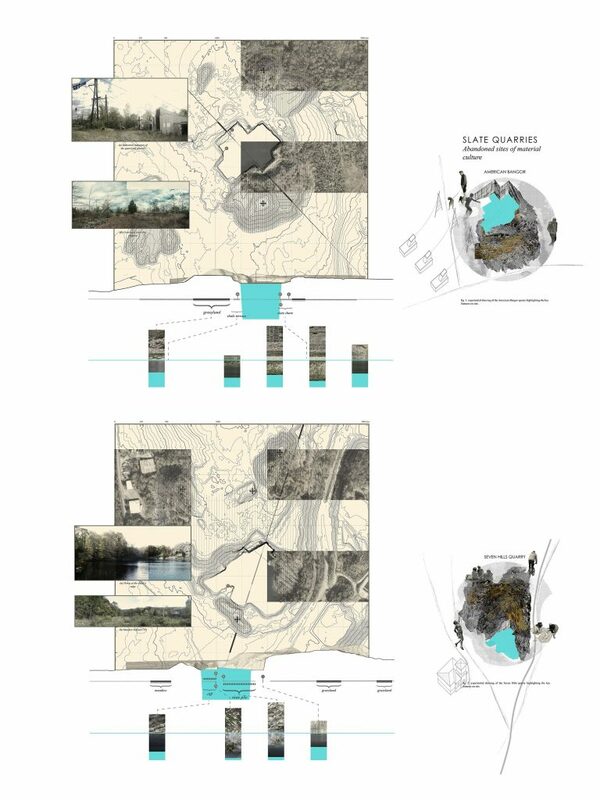 The studio project focuses on the slate belt region in the Lehigh valley in Pennsylvania whose history, memory and identity are closely tied to material and landscape. Permeability and impermeability of these materials and landscapes have shaped this region over time. 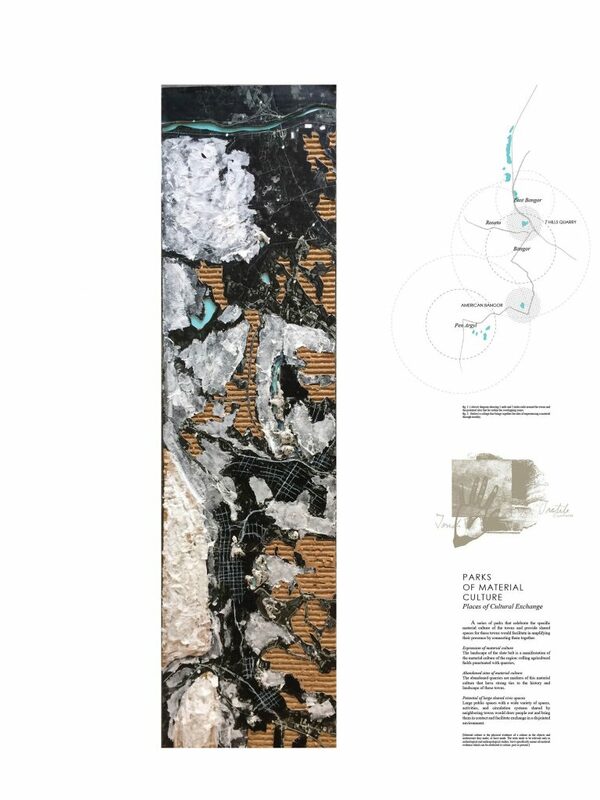 Rocks are quarried for their impermeability and soils cultivated for their appropriate permeability, the cultural landscape is constantly shaped and reshaped by the notion of permeability in many aspects. 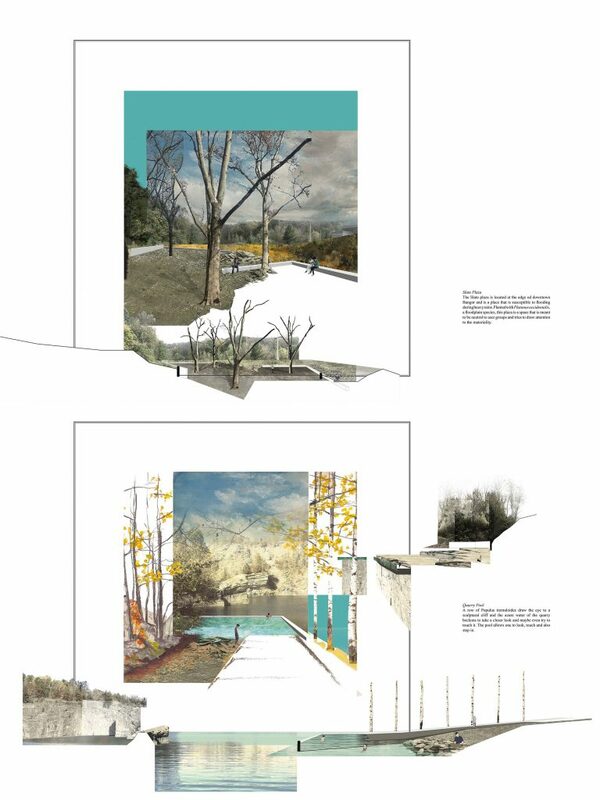 The proposal is series of parks that celebrate the specific material culture and provide shared spaces for these towns, facilitating in amplifying their presence in the Lehigh Valley by connecting them together. A sense of nostalgia exists among the people of the slate belt who were a part of the vibrant slate mining industrial past. The quarries were landscapes they intimately knew. 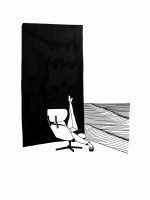 In order to channel this nostalgia and intimacy, the drawings are inspired by old topographical maps and sections. The views try to take a painterly approach combining analog photo collage, water coloring and using portions of photographs of oil paintings. How important was the notion of representation for the project? The project began with the making of maps of the Lehigh Valley region while being aware of the biases involved in the making of maps. The way in which these maps were visualized added to this bias, setting a mood and tone for the future of the project. Representation was key to building the project narrative, the story I wanted to tell, which in turn influenced the scale of the interventions and the imagination of the spaces. What is your take on the map? To what extent do you agree with the term ‘the map is not the territory’? 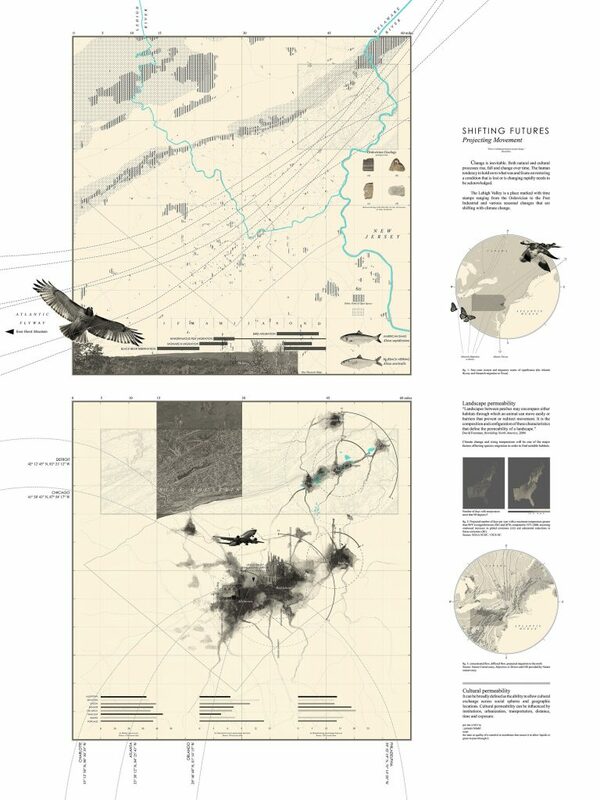 In my mind, a map is a drawing that constructs relationships between places, objects and people. Over the centuries many mapping conventions have been developed and defined to make sharing and understanding maps much easier, but the potential of maps lies in its ability to reimagine and redefine relationships. When Alfred Korzybski first used the phrase ‘the map is not the territory’ he was bringing to light the fact that a map was just a representation of reality but not reality itself, and this is something I completely agree with. 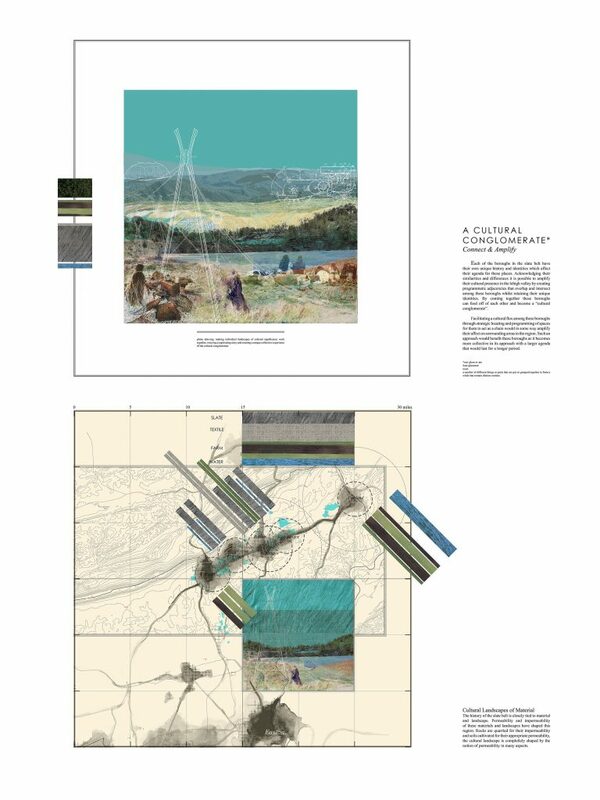 However, for architects and landscape architects to propose designs, the map is a very important drawing – “a constructed reality/territory” into which interventions could be drawn and visualized. 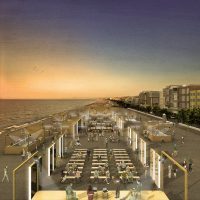 How did you record the site both in terms of physical landscape and attitude of the inhabitants? 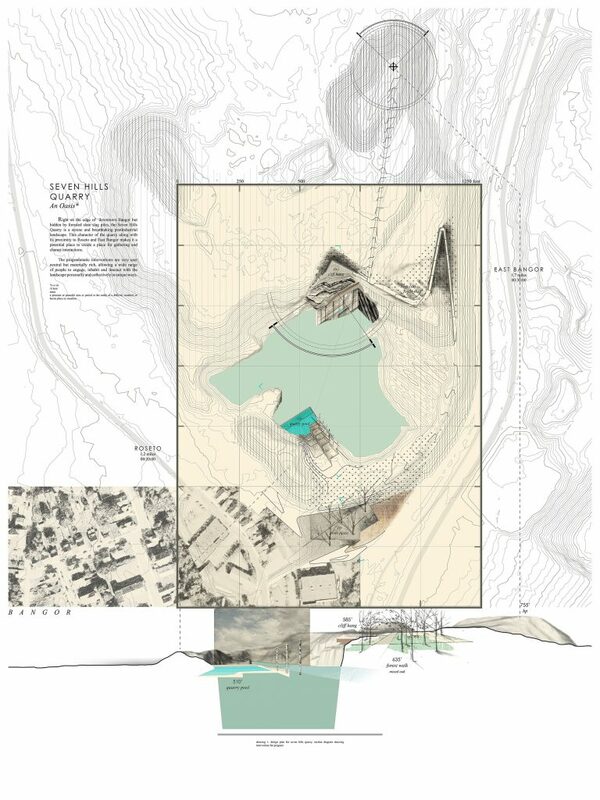 The topographical information for the two quarries were extracted from a high resolution digital elevation model. This served as a base onto which photographs of material gradients were keyed into. Photography was the most useful tool in terms of recording the site in terms of key views and material qualities. Material samples of different forms of slate from the sites were collected to experiment with various compositions. There were many meetings and interviews with the people of the towns where they told stories about what these quarries used to be like when they were operational and how different living in these towns was. Their stories painted nostalgic pictures and this definitely influenced the spaces and the visuals for the project. What is your take on threshold between analogue and digital? When confronting the act of drawing and representing medium do you find yourself working most comfortable with and why? Over the years I have realized that I enjoy operating in the threshold. Moving from one medium to the other keeps me energized and excited. After hours of staring at the screen, making analogue collages and drafting perspectives feels almost therapeutic. That being said, during the initial stages of drawing and representing I am most comfortable with pencil on paper paired with a bit of photoshop. What is your most precious tool? That will definitely have to be a wooden graphite pencil. Sketching an idea or drafting a section, if I have a pencil or can find one I will survive. If you could articulate all of the project in one drawing – what would this be? This is something I haven’t really figured out! 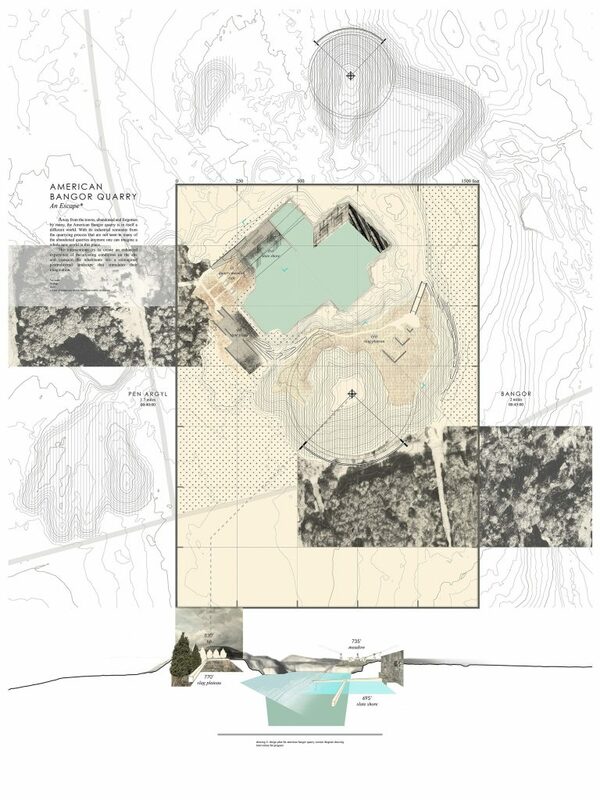 It is tricky because the project starts with a regional map and ends with a view of a pool in the quarry. I think it could be a large map showing the two quarries in relation to each other with the surrounding towns. The collages could get strategically nested in the grid of the map. I think this drawing would have actually benefitted the project.